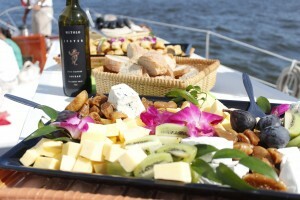 Join us for a two hour sail around the Chesapeake Bay while sampling wonderful wines from TBD. The representative from the winery will introduce you to four special wines while we are under sail. The cruise will be a relaxing sail including 3-oz samples of each of the four wines featured. Along with each wine is a delicious, perfectly paired bite (we call them magnificent morsels) to go with each wine. Includes a take-home, boat friendly, wine glass by Go Vino with the Woodwind’s logo on it. You will be able to raise the sails, steer the boat or just sit back and relax with your wine and food. Depart Annapolis at 4:00 pm, return at 6:00 pm. Price: $83 per person. Maximum 40 guests.